This page lists available ArcGIS Server services provided by AIMS. The REST API page has choices to let you view the service in ArcMap, ArcGIS Explorer, ArcGIS.com or Google Earth. If you want to include one of these services in your ArcMap session simply click the link "View in ArcMap". Report feedback or suggestions to AIMS here. 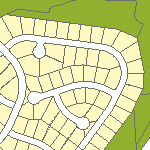 A composite geocoding service that tries to geocode first against addresses, then against centerlines, and finally against property polygons. It includes only Johnson County features. The locator returns coordinates in the Kansas North State Plane (feet) projection. A composite geocoding service that tries to geocode first against addresses, and then against centerlines. It includes both Johnson County and Miami County features. The locator returns coordinates in the WGS84 (latitude/longitude) projection. 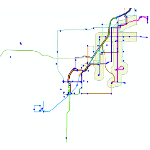 This map service is designed to be used as a basemap and reference map of Johnson County, KS. The cached map service is updated weekly and uses a Web Mercator projection to work with ESRI Online Services and the Google basemap. 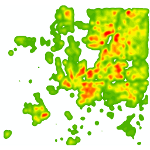 This service contains several density rasters, known as "heat maps", for displaying varying levels of activity. The datasets included are Population, Traffic Accidents, Crime, Foreclosures, and Taxes. 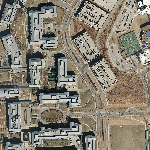 In addition to the features available on the basemaps, this map service contains reference points and labels such as major employers, schools, churches, government offices, and libraries. The Transit service contains public transportation routes and stops provided by Johnson County Transit in conjunction with KCATA. This map service is the same as the Geographic BaseMap, but in the Kansas State Plane North (feet) projection. Like the Geographic BaseMap, it is updated on a weekly basis. 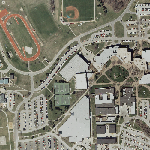 This imagery service contains historic ortho and aerial photography of Johnson County with years ranging from 1941 to 2016. The service also contains the 2006 DEM (Digital Elevation Model) and Hillshade. This service contains points for all building permits issued by cities that are reported to the Johnson County Appraiser. This is a service that contains every dataset available for download through the AIMS Free Data page. The datasets are organized into thematic groups, such as Transportation, Parks & Recreation, and Schools. The service uses simple cartography with no labeling. 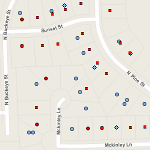 Many of these datasets can be viewed in the Base Map and Landmark services as well. AIMS also has several services that contain secured data, available to some data partners and subscribers. Access to these services is restricted to AIMS data partners that purchase CUE and/or JCLR subscription services or license full-county data extents. If your organization has been granted access to one or more secure map services, or created it's own service based on AIMS secure data, it is expected that the service should also have security in place at your organization. This includes map services made available via ArcGIS Online. Please contact our Mapper of the Day for additional information and access to these services 913-715-1600. 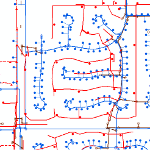 This map service contains all available utility line and point data within Johnson County. The service is only available to CUE participants and subscribers. 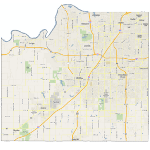 This cached map service contains the most current orthophotography (2018) for Johnson County in Web Mercator coordinates. This map service contains all of the planimetric features captured from orthophotography. The features included are building footprints, edge of pavement, all water features, and vegetation areas. 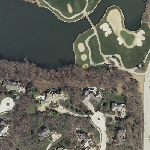 Planimetric features are updated on a bi-annual basis after new orthophotography is released. 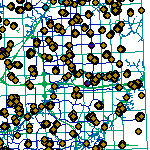 This cached map service contains the most current orthophotography (2018) for Johnson County in State Plane coordinates. The parcel map service contains all of the property data for Johnson County. The parcel data is maintained by Johnson County Records & Tax Administration, and includes fields maintained by Johnson County Appraisers.